Add all ingredients to a 3-liter leather wineskin and store to taste (2 days to indefinitely). To serve, tap 3 ounces into an ice-filled mixing glass. Stir to chill and strain into an Old Fashioned glass over a large ice cube (optional). Garnish with a twist of an orange skin, discarding the rind. If bottling, add ¼ oz. water per 6 oz. of cocktail and store in the freezer. 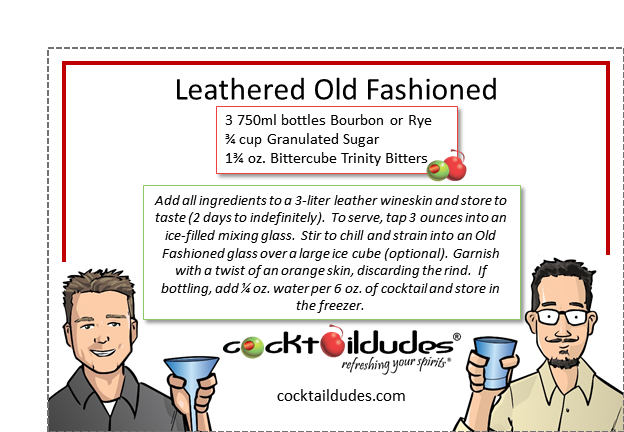 Here is yet another improvement on the revered Old Fashioned. The classic Old Fashioned is a wonderful cocktail to throw into a traditional Spanish wineskin (bota) and age. We already love barrel-aging cocktails and thought, “Heck! 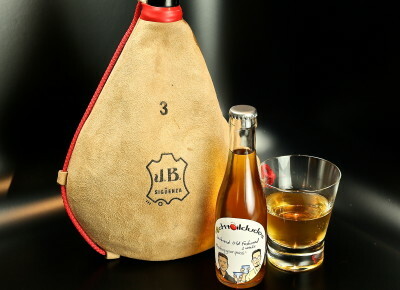 Why not try aging them in a wineskin.” Instead of the smoky depth that aging a cocktail in a charred barrel gives you, the wineskin provides a nice leathery complexity to the drink. It works great with brown spirits as that rich element interacts nicely with the leather. Age to taste, but we enjoy it most after about four days and up to two weeks. Enjoy it straight from the wineskin or bottle up the aged concoction. If it gets too leathery for your palate, then top off the wineskin with fresh ingredients (à la the solera method) to tone it down. Check out our other Leathered (Wineskin-Aged) Cocktails and learn the ins-and-outs of wineskin management on our Tools & Techniques video. Cheers!